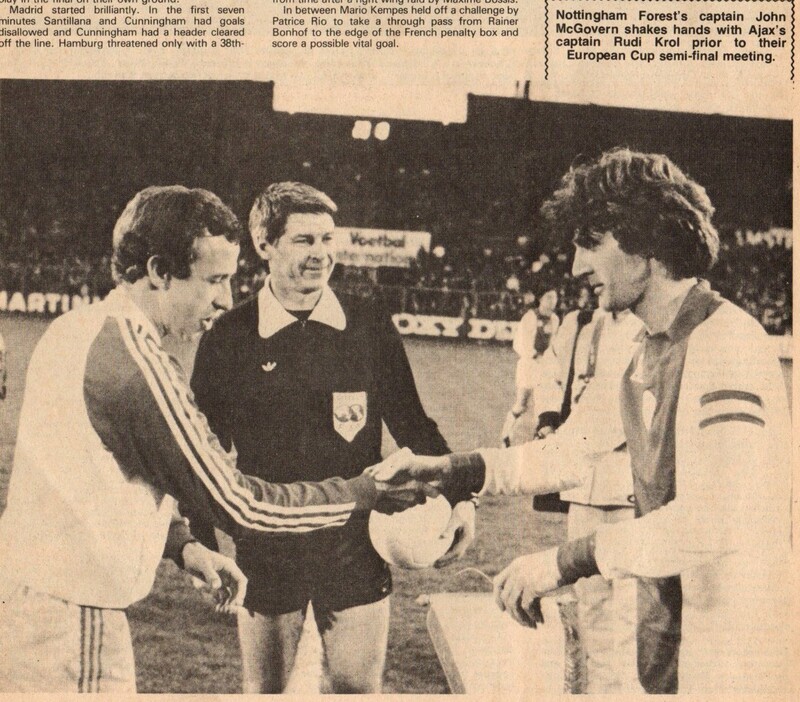 Nottingham Forest and Ajax were paired in the Semi-Finals of the 1979/80 Champions Cup. The English side Nottingham Forest were the defending Champions of the trophy and seemed set to repeat as Champions despite lagging in the League. Brian Clough along with able Assistant Peter Taylor, had assembled a squad containing many British Internationals such as Peter Shilton in the net, big-money signing Trevor Francis, English defender Viv Anderson, Scottish defender Kenny Burns, Northern Ireland midfielder Martin O’Neill and captained by the un-capped Scottish midfielder John McGovern. Nottingham Forest had qualified from their opening rounds by defeating Sweden’s Osters IF Vaxjo (2-0 home, 1-1 away), Romania’s Arges Pitesti (2-0 home, 2-1 away) and East Germany’s Dinamo Berlin (0-1 away, 3-1 home) in the Quarterfinals. Ajax, managed by Leo Beenhakker, had been declining in Europe since the glory years of the early 70s, but were still a force at home. Captain Ruud Krol was the sole remnant of that glorious side. Another veteran of the side was Denmark’s Henning Jensen, who had played for Moenchengladbach and Real Madrid in the past. 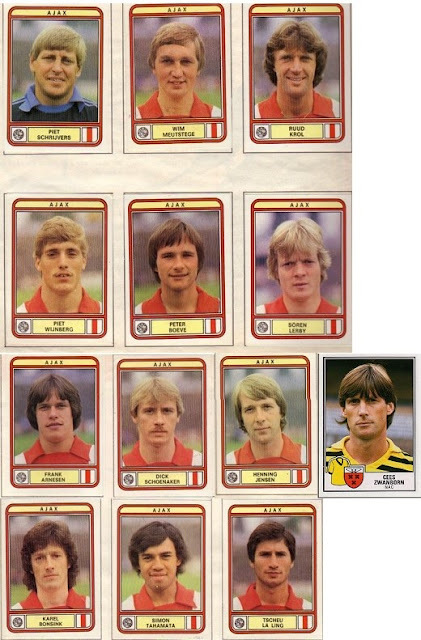 The side contained a pair of Danish players that would be known across the continent in a few years time (Soren Lerby and Frank Arnesen). A young Dutch winger Simon Tahamta was also starting to make a name for himself. 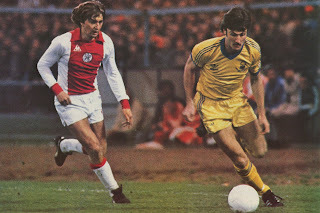 Ajax had qualified from their opening rounds by defeating Finland’s HJK Helsinki (8-1 away, 8-1 home), Cyprus’ Omnia Nicosia (10-0 home, 0-4 away) and France’s Strasbourg (0-0 away, 4-0 home) in the Quarterfinals. 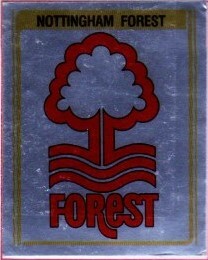 The first leg, on April 9th, was played at Nottingham’s City Ground. Brian Clough made one change from his basic lineup. 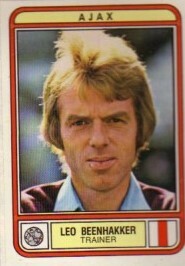 Stan Bowles started in midfield in place of Ian Bowyer. Nottingham Forest started the match maintaining their strategy of dominating the left side offensive sector. Beenhakker was intent on man-marking Forest’s attacking trio. 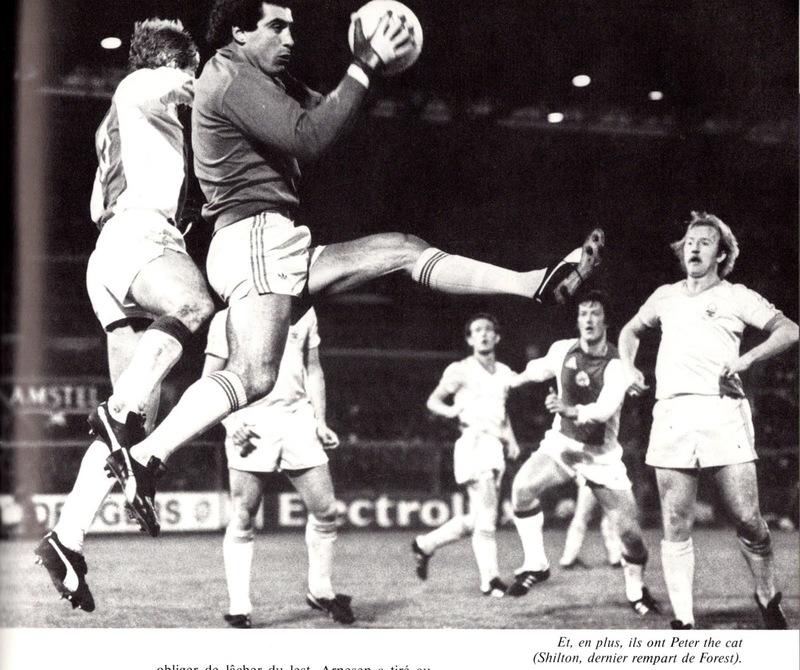 Cees Zwanborn was assigned with marking Birtles, while Boeve was charged with marking of Trevor Francis. Piet Wijnberg, started ahead of Wim Meutstege, to cover the left side threats of Robertson. 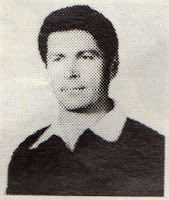 While Zwanborn managed to handle Birtles, Boeve appeared out of depth against Francis and Francis would be the driving force behind Forest’s win. 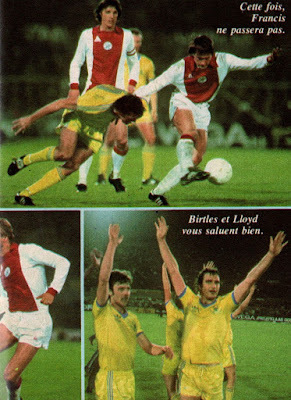 In addition, Lerby was unable to conjure up anything for Ajax as he had to defend from Martin O’Neill’s surges on the right side. Ajax were also intent on repeated fouls and obstruction to break Forest’s rhythm. Nottingham Forest took the lead in the 33rd minute. 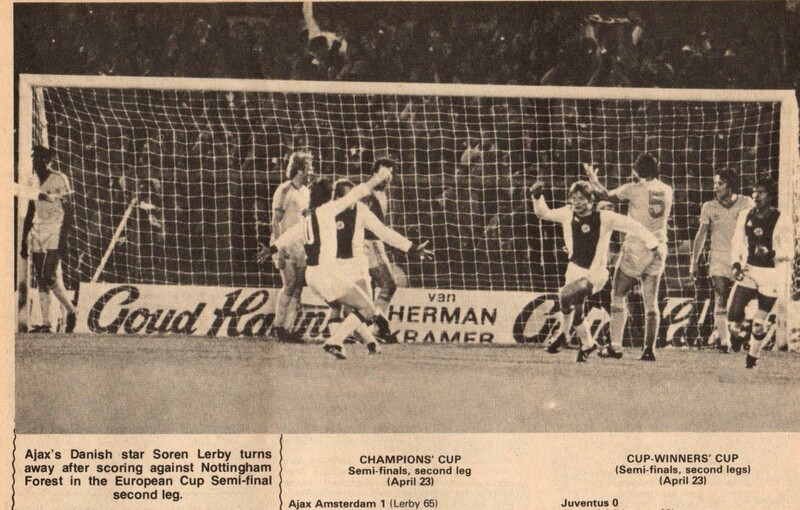 John Robertson’s corner from the left side (Forest’s eighth up to that point) was deflected by Lerby towards the near post, Schrijvers parried with his foot, and Francis struck the rebound from close range. 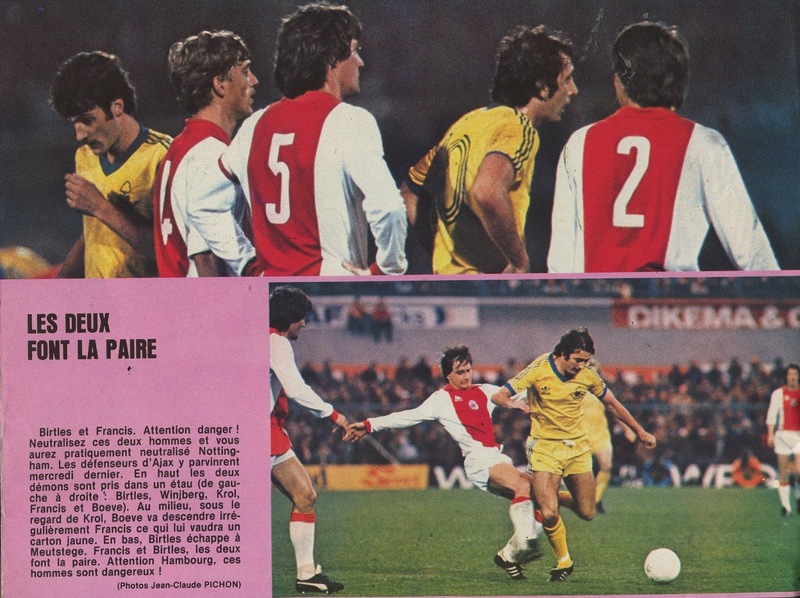 Early in the second half, Ajax’s Tscheu La Ling was injured, after a challenge by Frankie Gray, and replaced by Karel Bonsink. Forest doubled the lead in the 60th minute. Francis tried to lob over Schrijvers in the box, Zawnborn tried to control loose ball but it hit his hand. A penalty was awarded that appeared harsh, as clearly there was no intent. Robertson scored from the spot to give Forest a commanding (2-0) lead into the second leg. Trevor Francis had been excellent and Manager Brian Clough stated afterwards that, “If Trevor (Francis) maintains his current form, not only will he take us to the Final but win it for us”. Clough was still cautious of the return leg and stated, “We would be making a grave error if we thought our job is done”. For his part, Leo Beenhakker stated that, “We suffered a collective loss at Nottingham…at the moment we are having difficulties but this loss is due to lack of concentration…our problems are mental’’. The second leg, on April 23rd, was played at Amsterdam’s Olympisch Stadion. 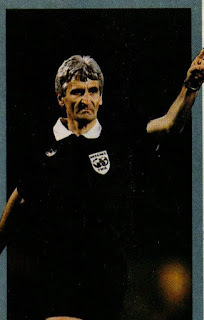 This time Beenhakker chose to start with Wim Meutstege ahead of Cees Zwanborn. Karel Bonsink also started ahead of Simon Tahamata. There was only one change with Forest. Ian Bowyer reclaimed his spot in midfield ahead of Bowles. Nottingham Forest chose to play with a defense in line and the use of the offside tactic, which confused Ajax as they would have expected defending in numbers from an away team protecting a lead. Ajax would dominate the match without really making concrete chances, as most of their attacks would break up in the last third. They had to resort to crosses that were handled by the Forest defense. Midway through the second half (66th minute), Ajax would take the lead. 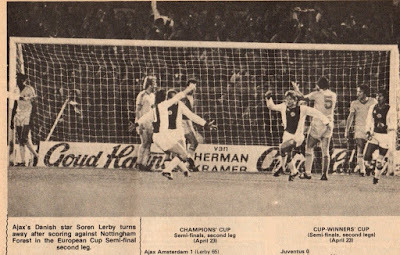 Frank Arnesen took a corner from the left side (Ajax’s 14th up to that point, and an unmarked Lerby headed in at the far post. Ajax could not make another breakthrough and were eliminated as many had predicted. It was obvious that the current Ajax crop were lightweight and not ready for European glory. During that week, Ruud Krol signed for Vancouver Whitecaps of the NASL. He later learned that Nottingham Forest had actually wanted him and he had not known about it. 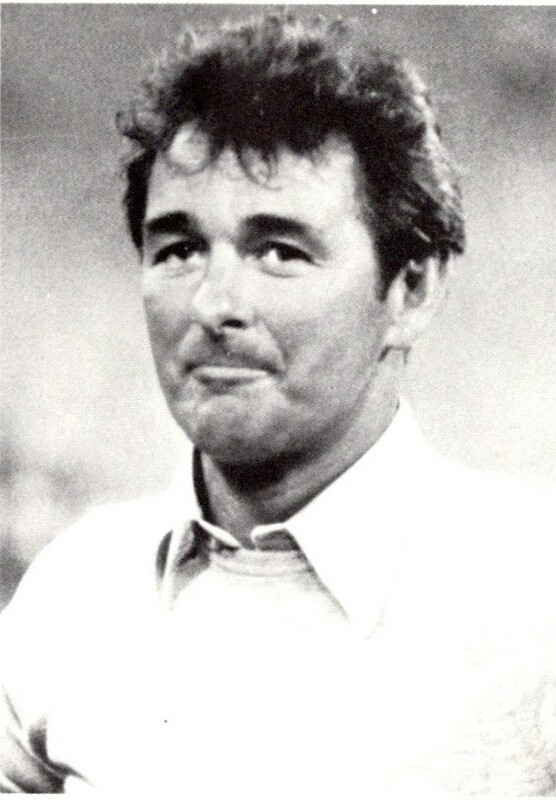 Clough had preferred not to contact player before the end of contract, preferring to discuss with Ajax Club President and Manager of Ajax (In another source not contacting Krol directly was said to have been at the behest of Ajax hierarchy). Nottingham were ready and willing to sign him, however, Vancouver had made a better offer. Krol expressed regret saying he would have preferred and had the desire to go to England. 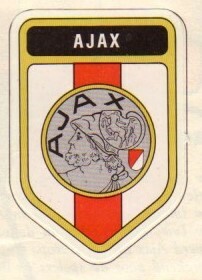 Ajax would go on to win the Dutch League title at the end of that season. 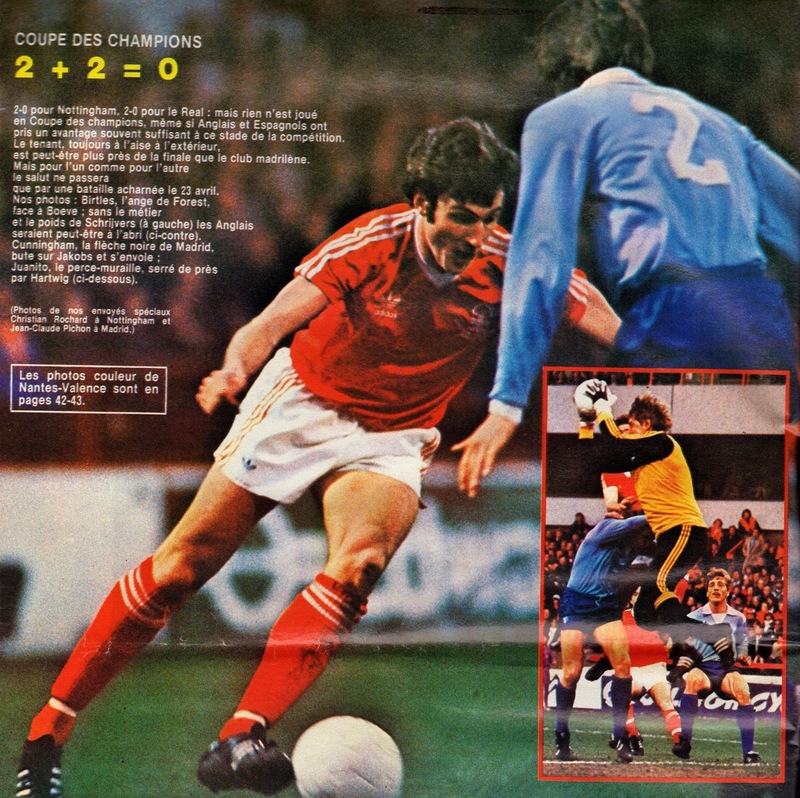 Nottingham Forest finished fifth in the English League, but on May 28th at Madrid, they defeated SV Hamburg (1-0) to lift the Champions Cup for the second successive season. 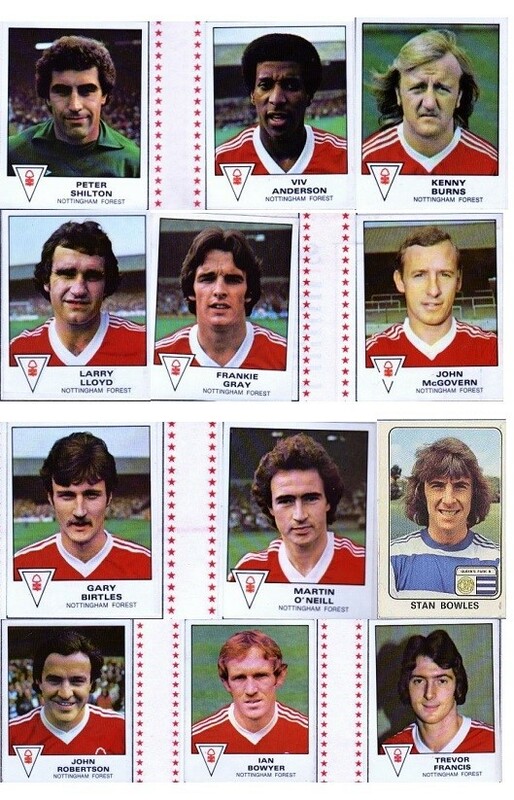 Was Stan Bowles' career with Forest so fleeting that he never appeared in their kit on a Panini card?